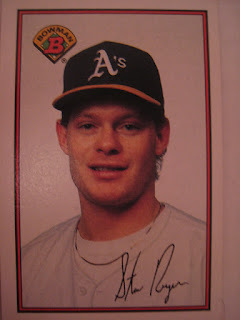 Stan Royer, the A's first round draft pick in 1988, played four seasons in the major leagues for the Cardinals and Red Sox, twice hitting over .300. Now the President and Co-Founder of AMD Financial Services in St. Louis, he kindly answered my questions about baseball cards. "My first baseball card wasn't even taken on a baseball field like most cards are. It was taken in a studio. I'm kind of partial to the up and coming card when I was with the Cardinals. It might of said rising star on it. Not sure. 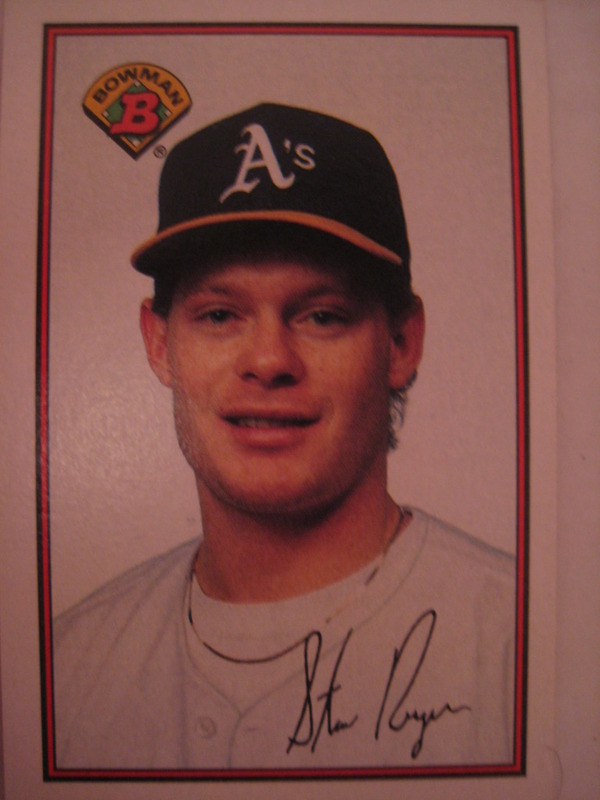 I do not collect baseball cards, but I have tried to collect all of my cards." Thanks! Though his 1993 Topps card actually says "Coming Attraction," it does have a lot of stars rising in the background. 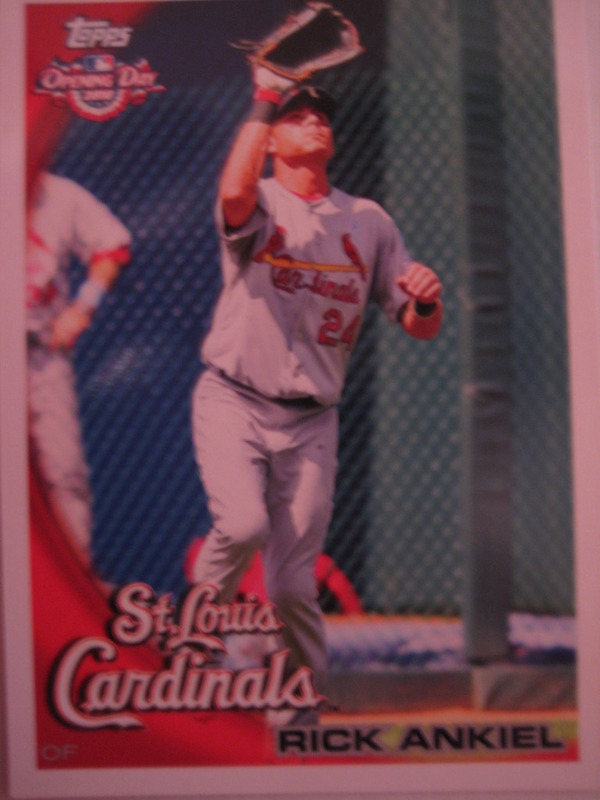 I have nine cards of Rick Ankiel. 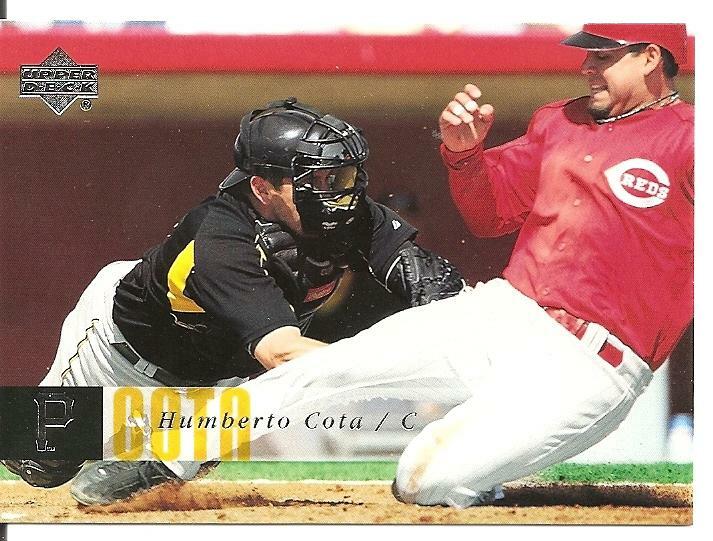 This one is from 2010 Topps Opening Day. Playing career: Rick Ankiel has had one of the most unusual careers in baseball history. He came up with the Cardinals as a pitcher and had a great regular season, going 11-7 and finishing second in the NL rookie of the year voting. Then he suddenly and completely lost the strike zone in the playoffs against the Mets and Braves, walking 11 batters and allowing 5 hits in just 4 innings over 3 games. He was unable to regain his form the next year, went down to the minors and hurt his arm. He decided to come back as an outfielder and not only worked his way back to the major leagues but became, if not a star, at least a credible regular, hitting 25 home runs in 2008 for the Cardinals. Where he is now: He is a free agent after hitting .239 with 9 HR and 37 RBI in 122 games for Washington last year. My memories: I remember thinking that we would never see him again once his wildness problems hit him full on. It’s amazing how he turned himself into a legitimate major league hitter. Interesting stories: Many believe Ankiel’s mental problems as a pitcher came from his relationship with his father, who pushed him very hard, often against his wishes, into becoming a great baseball player. Earlier in 2000, his father was arrested for running a cocaine-smuggling ring. You can read more about the Ankiel family here. 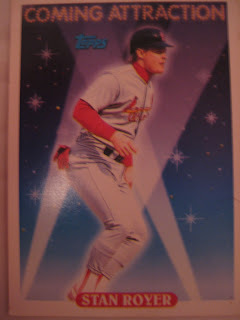 He used to have a rather strange website called Rick Ankiel Online. The site is gone but you can find some of the highlights here. Google Autocomplete results: He is second when you type Rick A, between Rick Astley, singer best known for RickRolling, and Rick Adelman, former Houston Rockets head coach. There do not appear to be any other prominent Rick Ankiels. Coming up next: The next profile will be Willie Ansley. If you're not aware, Night Owl has this great new feature called the One-Card Challenge, where you post sets where you need just one more card. I posted a few cards, including the one I needed from 1991 Leaf, Pat Combs. Captain Canuck of Waxaholic sent me that card. He also sent me the last few on my wantlist for 1991 Upper Deck, about seven or eight cards. He included a nice little note - "Glad to be able to finish off some sets for you." Indeed, he should have - except I made mistakes on both wantlists! Turns out I'm still one card short on both sets! Anyone have 1991 Leaf #38 Roberto Kelly or 1991 Upper Deck #100 Checklist to trade? 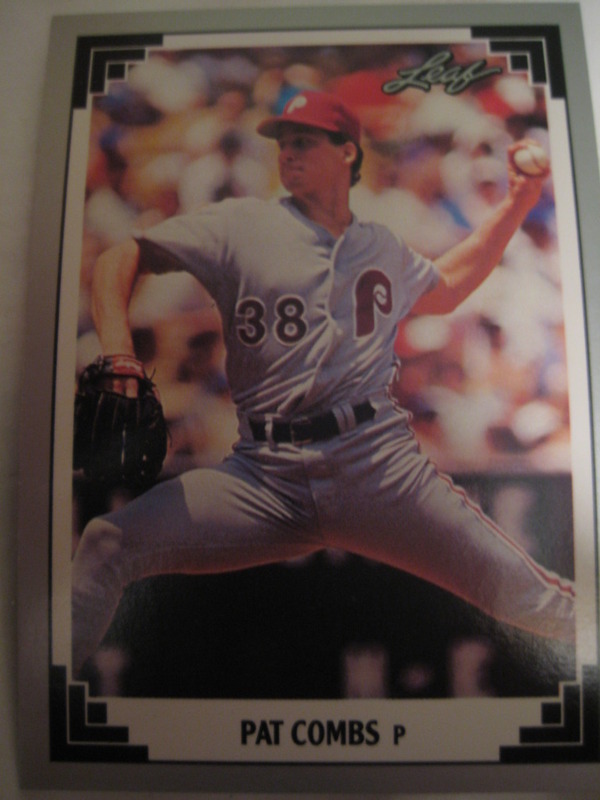 Kris Benson pitched nine seasons in the major leagues, mostly for the Pirates and Mets, winning 70 games. Now Managing Director at Monarch Wealth & Business Management, a NY-based financial services firm that represents high level athletes, entertainers, business professionals, and high net-worth individuals, he kindly answered my questions about baseball cards. 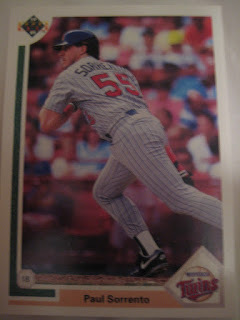 The first card that I had was a dual Topps card with myself and Billy Koch. We shot it at the Clemson University campus Botanical Gardens. Since it's my first card, that's my favorite. I have some nice cards. 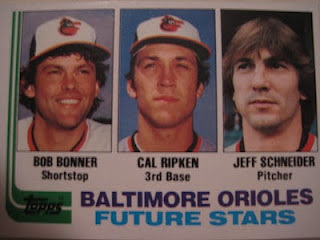 Rookie cards of Cal Ripken, Tony Gwynn, and Rickey Henderson are very cool. Guillermo Moscoso came up with the Rangers in 2009, and was traded to Oakland before the 2011 season, where in his first full season in the majors he went 8-10 with a 3.38 ERA. Two weeks ago he was traded to the Colorado Rockies. He kindly answered my questions about baseball cards with this brief comment. "Every year I get new cards... So I like all that I have ..."
Catcher Humberto Cota played seven years for the Pirates. His best year was 2005, when he hit .242 with 7 HR and 43 RBI. For the last three years he has played for the Monterrey Sultanes in the Mexican League, hitting .327 with 10 HR and 45 RBI in 2011. He kindly answered my questions about baseball cards. "No I don't collect!! There's one of mine tagging Jacob Cruz at the plate in Spring Training!! He's a good friend of mine." Thanks! I don't have that card, from 2006 Upper Deck, but here is one I do have, from 2000 Bowman. A while back I got a Cal Ripken Christmas bear as package filler from one of my Amazon purchases. I couldn't get any Orioles bloggers interested in it, but Baseball Dad from All Tribe Baseball has a son who is a big Ripken fan so I sent it to him and in return he sent me some cards from my wantlist, mostly from 2007 Topps. I really enjoy the card backs from that set. 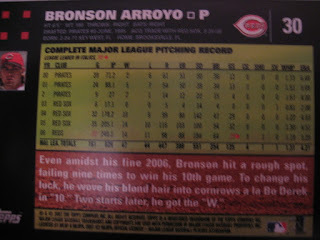 The best from the ones he sent me is the Bronson Arroyo card. 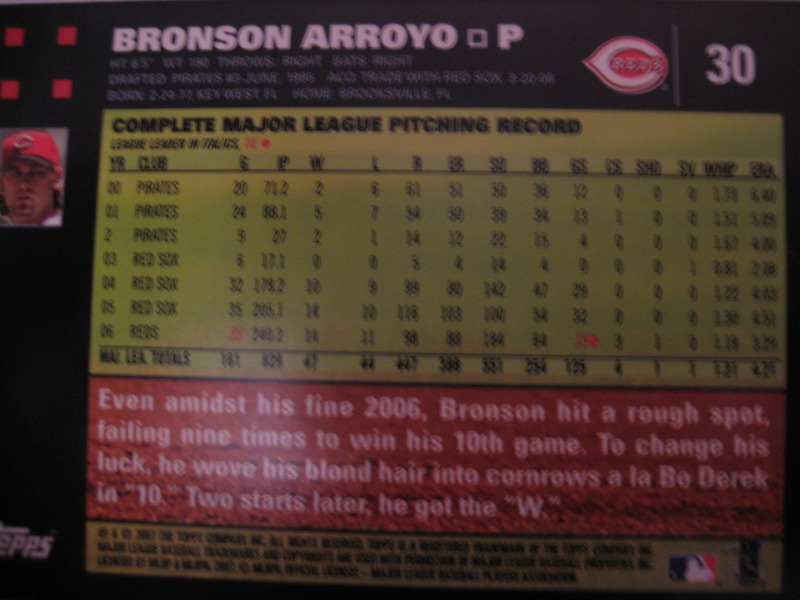 There are two errors (2 Pirates instead of 02 Pirates and incorrectly saying he led the league in games pitched), plus a rather bizarre comparison of his hair with Bo Derek's! 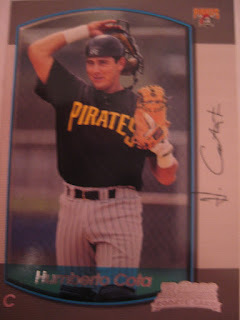 Also, the new This Week in Baseball Cards is up at the Hall of Very Good. Enjoy! 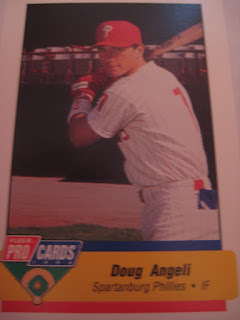 I have one card of Doug Angeli, from 1994 ProCards. Playing career: Shortstop Doug Angeli played five seasons in the Phillies organization. His best season was 1996 at Reading, when he hit eight home runs in only 187 at bats. Where he is now: Head coach/Owner of the Spartanburg Phillies travel team in South Carolina. Google Autocomplete Results: He is fourth when you type Doug Ang, between Doug Anglin, founder of the UCLA Drug Abuse Research Center, and Doug Angove, a chiropractor in Minnesota. There do not appear to be any other prominent Doug Angelis. Coming up next: The next profile will be Rick Ankiel.